Greens are various flood warnings. Pink = winter storm warnings. Blue = winter weather advisory. 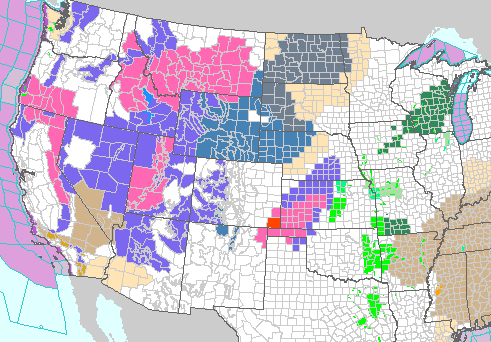 The deep green (Nebraska-Wyoming)= winter storm watch. Very active weather pattern continues! Good to see all the pinks/purples in the CA mountains - they so desperately need the snow this year (and lots of it).